Myst, the legendary graphical adventure game, has made its iPhone debut. It’s available for download from the App Store for $6. Just like you remember it. Only smaller. Myst is a first-person adventure game that drops you onto a mysterious island filled with strange artifacts. You use books created by an explorer named Atrus to travel to different worlds, or “Ages.” Along the way, you’re tasked with solving puzzles — unraveling mysteries about how various machines and gadgets work, and more — and in the process, you learn the back-story of the game’s characters. 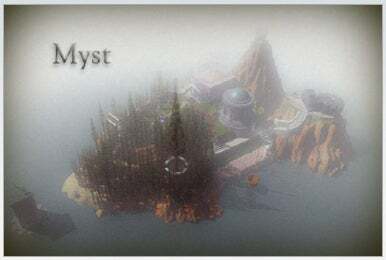 Myst first appeared on the Mac back in 1993, and it was a phenomenon — getting ported to numerous other platforms and, for years, being the best-selling video game in history. It ultimately spawned a number of sequels and spin-offs. The iPhone and iPod touch version is a complete rework of the original, using the original pre-rendered scenes, puzzles and movies. While the original Myst was a “point-and-click” adventure game, the iPhone version uses touchscreen input in much the same way. Myst requires a very large amount of storage space — 1.5GB of free space to install, though it will reduce in size to 727MB or so once it’s on. System requirements call for iPhone 2.2.1 software.